The Gaslamp #1 San Diego Club Crawl provides a unique Tour to the best downtown nightclubs. Meet new people every Friday and Saturday night while partying. The San Diego Club Crawl offers a VIP experience that allows guests to skip long lines and avoid paying any cover charges. We provide a host who guides you from Club to Club. The host will go over all details of the night when you check in. Call us to get the exact list of venues, it changes every week. Registration is at 8:30pm. Please do not show up late. ::| All sales are final. No refunds or exchanges. We will give you credit for a future crawl if there is a death, act of God, or extreme illnesses that prevent you from attending. DRESS CODE: Strict dress code is enforced for all ticketholders. Venues reserve the right to refuse entrance or service to any and all ticketholders their agents deem not dressed appropriately. One venue’s dress code may be stricter than another venue’s dress code. 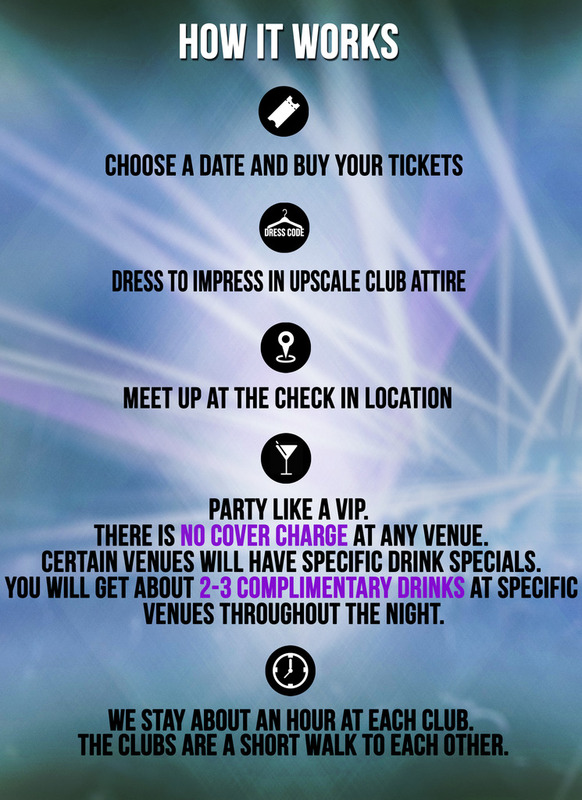 Upscale club attire is required; look sharp, dress to impress. This includes being well groomed and having a clean, polished look. Footwear must be clean and nice: no tennis shoes. No ball caps allowed. Men are suggested to wear fitted attire, collared shirt or dress shirt, nice pants and/or dress pants, dress shoes, jacket. Ladies are suggested to wear dresses or skirt outfits; nice skinny jeans or upscale legging outfits are okay if they can be really dressed up. Ladies are suggested to wear footwear that looks good but that they can dance in and move comfortably in throughout the night. Ladies are suggested to leave their big purses and clutches at home and to have a nice small cross-body purse so that they can be hands free to hold their drink while they dance. *Free Drinks are a complimentary drink provided by the venue, at the venues' discretion. In some cases, ticketholder does not get to choose what complimentary drink is provided to ticketholder. If ticketholder appears to be over-intoxicated, the venue has the right to deny ticketholder entry; there are no refunds if a venue denies entry for ticketholder appearing to be over-intoxicated. Each venue must abide by Fire Marshall capacity regulations, in which case, you may not be able to enter a venue immediately. Each venue may have private/reserved sections of the venue that are not accessible to ticketholders. Venues may be replaced with other venues.